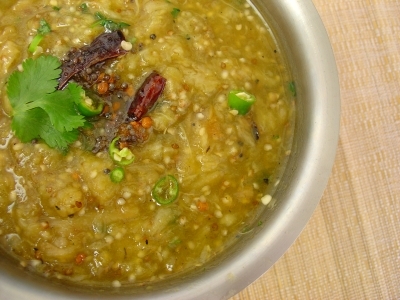 Kobbarikaya mamidikaya pachadi has a special place in traditional Andhra’s raw cuisine. Sweet coconut and sour mango blend superbly. The spice from chillies and seasoning add an extra layer of flavor. 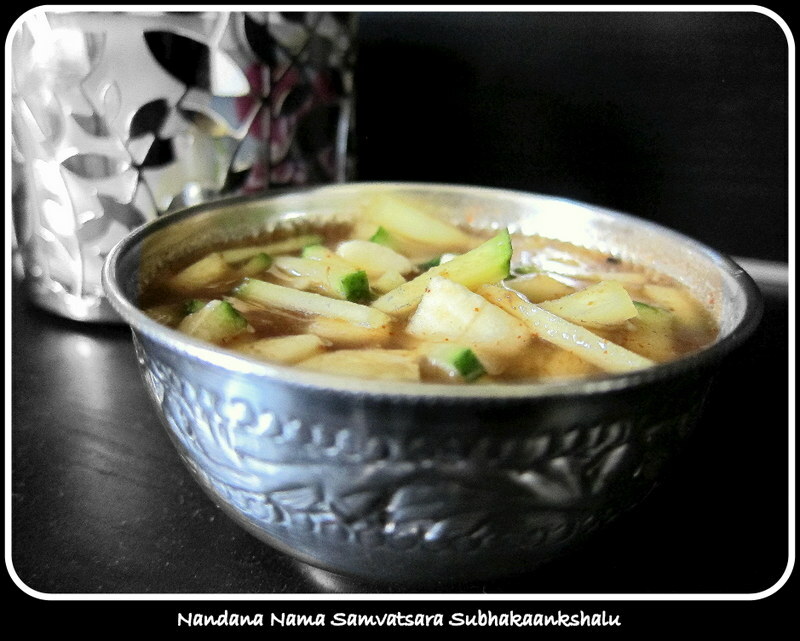 Except for seasoning, all the ingredients used in this dish (pachadi) are raw. This is a simple, yet very tasty and easy to prepare dish. This is my family’s all time favorite pachadi. Cut the coconut into small pieces or grate. Peel the mango and cut into small pieces. 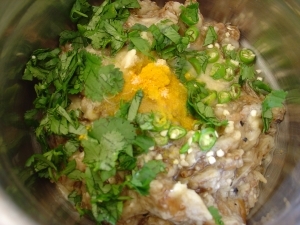 In small pan heat oil, add mustard seeds, methi seeds, red chillies, hing. Allow the seeds to sputter, now add the curry leaves and remove from heat. Keep them aside. Grind coconut, mango pieces along with fried red chilles / green chilles, salt and turmeric; grind the mixture coarsely by adding water little into a paste. Adjust the taste, if needed add little mango for sourness. Shift the mixture into serving bowl. Add the fried seasoning and curry leaves and mix well. Serve with rice and ghee along with perugu merapakyalu. You can use frozen coconut instead of fresh. Defrost the coconut and then use. Use red chillies or green chilles. Mango should be sour. If the mango is too sour use little less or add coconut vice versa. This is my entry for Nupur’s A-Z vegetables. Hara dhaniya patta (in hindi), known as coriander leaves or cilantro. This is one of my favorite snack when ever we visit Chat House (Sunnyvale, CA). Spicy hari (green) chutney with murmur and sev mixture with roasted peanuts, onions, tomatoes, cucumber and topped with sweet chutney makes this a real item number. Yesterday it was cold outside and wanted to eat something spicy but not in a mood to spend time in front of stove. I was looking around in the pantry to come up with something instant (not in mood for noodles also) and suddenly I saw murmur and this recipe popped into my mind. It’s been longtime since I made this, but I still remember the taste of delicious bhel. Grind all the below ingredients into a smooth paste. Do not add water. Sugar will stop the chutney turning into brown color. Sweet chutney/ ketchup, sev, thinly sliced cucumber pieces as showed in the picture and chopped coriander leaves. In a large blow mix all the bhel ingredients. Now add the hari chutney and toss together. Take a serving plate, place desired amount of bhel, drizzle little sweet chutney / ketchup and garnish with sev and coriander leaves, decorate the plate with cucumber pieces as shown in the picture. Serve immediately. You don’t even need a spoon as you can scoop the mixture with cucumber pieces. You can add raw mango pieces to jazz it up. If you are allergic to peanuts substitute with roasted cashewnuts or just leave the nuts. Just use your imagination, mix and match the veggies and enjoy with a hot cup of “T”. Use thick sev mixture, and for garnish you can use thin sev. Few days back I was browsing for recipes with phyllo dough and came across this wonderful blog. I started looking at the recipe Index and came across this delicious sun-dried-tomato hummus. I love Hummus and wanted to make at home for long time. The picture was so tempting and as I scrolled down recipe was soooo easy to prepare and I had all the required ingredients in my pantry. I had few questions as I never used tahini and looked around for tips but not satisfied, so I decided to ask Nicole (pinchmysalt), left a message in her blog, and was thinking to check back couple of days later. I didn’t expect that she would reply so fast, but she did. She patiently answered all my silly questions and finally I made this tasty Hummus. It is very easy to prepare and no cooking is involved. I followed the guidelines of the original recipe for little heat I added red pepper flakes, but accidentally added garlic and then I realized that Nicole’s recipe is without garlic. Garlic gave a light sharpness to the hummus as I used one clove. I guarantee you folks this is really good one and easy to try and you won’t be disappointed. 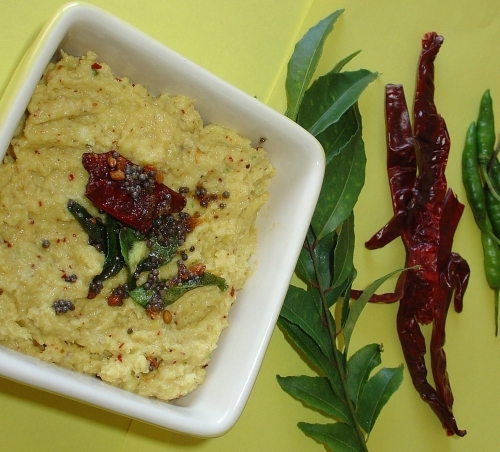 Check out pinchmysalt for sundried tomato hummus, what made me fell in love with her blog was simple and easy to prepare everyday recipes, wonderful pictures which was ofcourse taken by her, notes and write-ups. One more dish where no cooking is involved. Cucumbers are rich in vitamin c and also contains some amount of dietery fiber and contains lots of water. In general dosakai has light punget smell, which is why many people dislike, but when this is mixed and grinded with spice mixture, the smell compeletly disappears. This spicy, sweet and sour dish always takes a center stage at my place when ever I make. This is an other delicious dish from my MIL’s kitchen. Heat oil in a small pan, add red chilles, mustard seeds, methi seeds. Allow mustard seeds to sputter, add hing and remove from heat. In a grinder/food processor add to this mixture, tamarind, jaggery, turmeric, salt and grind coarsely. Add green chillies and coriander leaves and pulse for few times. Remove and mix it the dosakai pieces. Adjust the taste if needed. Pulse the whole mixture just one more time. Serve with rice. Jaggery is optional. While adjusting the seasoning you can add few drops of lemon juice. 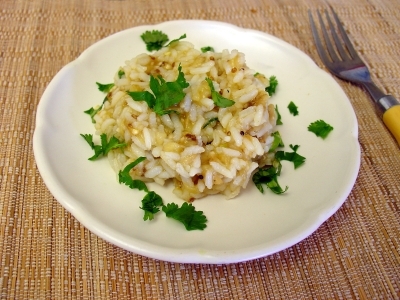 We usally mix little oil/ghee in rice and then eat with this chutney. 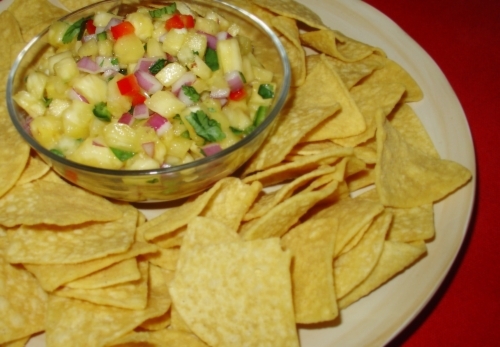 You can even serve this as a dip .Try it out . I’m sure you will enjoy it.